Blink by Malcolm Gladwell explains how snap, unconscious decisions work. Why they can be as accurate as deliberate ones and, most interesting, how we can get better at them. Gladwell talks about Adaptive Unconscious instead, a sort decision making machine that operates unconsciously and quickly -this is basically the same as “fast thinking” in Thinking Fast and Slow-. The idea behind Thin Slicing is that our mind can see overarching, significant patterns, even with small samples. This means that we can often make a snap judgment with a high rate of accuracy on little information or exposure. The example Gladwell uses for experience is John Gottman, who became famous for predicting with a 90% accuracy rate which couples would divorce just by looking at a 15 minutes conversation between them. And looking at what’s relevant helped strangers to better assess people’s personality by looking at their room compared to their long term friends. Contempt, signaled by eye rolling, eyes shutting, patronizing voice..
Gottman mostly looks at the ratio between positive and negative emotions. The positive signs must outweigh the negative by at least 5 to 1. Read more from Gottman here. Gladwell also points out that asking couples about the state of their marriages didn’t give many clues. Most people had no idea how they came across during their communications. There’s little correlation between doctors’ mistakes and the incidence of legal proceedings. The correlation instead was very strong with the way doctors treat patients. The difference was not in the information or amount in the information, but how they spoke and treated the patients. Gladwell says a researcher could predict the likelihood of a doctor being sued simply by listening to the tone of voice -without any content at all-. The more dominant the doctor appeared, the more likely he was to be sued. The less dominant and more concerned the voice, less likely to being sued. The voice basically works as a proxy for the doctor’s attitude. Caring and respectful or disrespectful and talking down? Gladwell discusses the subconscious calling it a “locked door”. Many decisions we make, he says, we can’t even explain them consciously not even after we reflect on it. Tennis coach Vic Braden was Blink’s example: he was able to say when a player was going to perform a poor serve but he wasn’t able to explain why. The locked door also works the other way around: we can decide what we like and want consciously, but our conscious list of traits is a poor predictor of what we actually like. That’s why it’s not uncommon that speed daters will end up picking participants who look and behave like nothing in their pre-drawn criteria. Gladwell also talks about the priming effect. Remembering students about their genders or ethnicity , for example,brings in their mind the associated stereotypes and they score better or worse depending on that stereotype. Remind women they’re women lowers their math test scores. Remind blacks they’re black lowers their scores. Remind Asians they’re Asians raises their math scores. Similarly, having people do a test with many age-related words had them walk slower. Students also interrupted other people’s conversations right away or waited indefinitely depending if they were primed with politeness or rudeness. Gladwell mentions this can be an adaptive response within ourselves. If our brain believes our environment favors this or that type of personality, then we start behaving more like our environment. And of course, people had no idea of the outside influence that changed them. I loved how Gladwell debunks the merits of “explaining one’s behavior”. He presents an experiment in which people were subtly helped solving a puzzle. But when asked how they solved the puzzle almost nobody mentioned the external help and all focused on their own mental processes to reach the solution. Gladwell says it’s not that the people were trying to cheat, but the hint was so subtle their rational brain never realized. So when asked about an explanation our rational brain doesn’t tell the truth, but comes up with what seems the most plausible solution. But the most plausible solution is seldom the real explanation. We are really ignorant about what motivates our decision, says Gladwell. And we should really be saying “I don’t know” more often. Chapter 3 focuses on the disadvantages of our subconscious decisions. We have a strong tendency, for example, to vote for those who “look the part” rather than those best prepared at carrying out the duties -as it happened with Warren Harding-. Computer tests developed at Harvard University also revealed that when we are forced to make snap decisions we fall back on (racist) stereotypes. No matter whether the person was or wasn’t racist or whether he was aware of it or not, most still showed racism towards black people under the pressure of time constraint. The biases that we have in our subconscious will determine our behavior in ways that we don’t consciously control. Test your own implicit biases here, but be aware there’s much controversy and criticism on these tests. A friend of mine used to say that “only white people pay full prices”. A study on car sales showed how white people on average end up paying less than other races. And not because they’re better negotiators, but because salespeople tend to haggle less aggressively. Gladwell says it’s possibly because when a sales rep sees a white person the stereotype is that he will be more educated and likely less likely to fall for his tactics. Would it pay if a salesman was able to rid himself of stereotypes? Gladwell suggests so when he introduces Bob Golob. Golob manages to sell twice the average of other salesmen by, says Gladwell, eliminating biases towards customers. Gladwell also suggests a way to change our biases in a way that our snap decisions won’t be affected by stereotype and preconceptions. To do so we should spend more time with the people and subjects we are biased towards. Understanding them and their culture, becoming familiar with them as people. In chapter four of Blink Gladwell says that our western culture values decisions which are complex and time-consuming. That should not be the case, he says. The example here is the decision-making process in Emergency Rooms. He says that to assess whether a patient is having a heart attack doctors use all information they can gather. The process takes long and doctors face a “data deluge” that clouds their brains instead of helping. When finally a new algorithm with only three data points was tested, it proved not only to make for faster decision making, but also to be more accurate than the old “take all data” system. Sometimes, to make important decisions, less is more. Gladwell also quotes another research showing that the more information the psychologists received, the more they felt confident about their diagnosis. But the rate of correct diagnosis didn’t improve with more information. Gladwell says when it comes to face recognition we are great at visual recognition but terrible at verbal description. You could write a book a person’s face and still, you wouldn’t recognize it. A snap of a second looking at the picture of Marilyn Monroe face and you would recognize her right away though. Gladwell talks about how different people can “thin slice” things differently. Experts can thin slice much more efficiently compared to newbies. Gladwell repeats again the concept that we can learn more from people by observing body language, facial expression or looking at their room than by asking them directly. While people are very good at explaining their actions, those explanation aren’t necessarily correct. Especially when the behavior arises from the unconscious. The author introduces the Coke VS Pepsi tasting battle. He says that consumers don’t experience the product just by itself. But product, packaging and “brand” are experienced all together. The mistake Coca Cola made was to ascribe their loss of market share entirely to the product. The author explains the launch of a brand new, groundbreaking chair with steel frames in plain sight. The first market researches showed people didn’t like it. The company launched the product anyway and it became a hit. Gladwell says it’s because people misinterpreted their feelings. They said they hated the chair but what they really meant is that it was so new and unfamiliar they were not used to it. This is often when something is new and groundbreaking. People will say they don’t like it, but it’s only because they’re caught off-guard or shocked. And it’s easy to miss the difference between the two just by going with testers’ scores. Because given the time to warm up to it it’s also very possible they might start liking it -or loving it- (but of course, it’s also possible they won’t like it). We love market research because it provides scores, number and a feeling of certainty. But there can be no certainty with new groundbreaking products. Gladwell says we can’t look directly into our subconscious, but we can understand it by analyzing our reactions and behavior. All experts that have become great at snap judgments and thin slicing did so by breaking down their area of expertise and analyzing it bit by bit. It’s similar to psycho-analysis. You analyze your thoughts for years and then start to learn how your mind works. Experts do the same with the object of their expertise. Stress can help us focus. It’s what some top players refer to as “the game slowing down”. It’s because our brain drops all unnecessary stimuli and focus exclusively on what matters. It’s the so called “tunnel vision”. Gladwell says this is between 115 and 145 heart beats for minutes. But above that threshold stress make us ineffective. Most of us, as a matter of fact, get too aroused in stressful situations. Above 145 part of our body functions start to shut down. That’s why for some it’s difficult to even dial the police phone number. Our snap judgement tend indeed to be impaired by extreme stress or life and death scenarios. Even simply being under strong time pressure, without life or death scenarios, make us unable to see clues in body language and facial expressions. Extreme time pressure situations make us autistic, the author says. It convenes that we should avoid relying on our snap judgment in high stress situations. Whenever you can, disengage instead, take a break and resume later. When people tell you why they did what they did, don’t listen. They are often fooling their own mind and coming up with what seems to make sense, not the real reasons. Don’t take reactions to new products at face values: they need interpretation. A “I hate it” could easily mean “I’m so unfamiliar with it I can’t make sense of it (yet)”. Unless you already know you perform great and can handle well high stress situations, don’t engage. Take a break and resume later on. Becoming great at Thin Slicing means knowing something so well that you know what matters and you can deconstruct complex realities it to its basic elements. In a way, The Power Moves is thin slicing human interactions and training your snap judgment of people. At times I feel like Gladwell bends stories and examples to fit his narrative. For example “analyzing someone’s room in 20 mins” VS “knowing someone for years” are NOT measuring the same thing. So you can’t tell me the former is an example of “superior snap judgement”. Snap VS Deliberate… Wait, what’s the point?? The narrative of snap decisions VS deliberate ones reminds me of the “EQ VS IQ” in Emotional Intelligence. I feel it’s childish and doesn’t add any value pitting two non-antithetic concepts against each other: they both have their own place and time. Could have been shorter and there is little focus on how to actually use this information. I don’t see much power in the dichotomy of “snap decisions” VS “deliberate ones”. They are both useful. 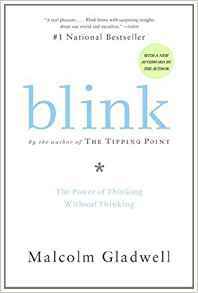 But what makes Blink by Malcom Gladwell an amazing book is all the explanation that goes into snap decision making. Much of that research will most likely open some new door of psychological understand for you. On a personal level, it made me realize the usefulness of this website. From a Blink point of view, The Power Moves is making you an expert at social interactions so that you can thin slice the reality around you. How you treat people is the biggest determinant of how they will perceive and treat you.